Come aboard a Princess cruise to Alaska and really feel like one with the ‘last frontier’ as you glide along on the Voyage of the Glaciers tour, something only offered in a Princess Alaska cruise. The Princess Cruise line has a slogan that is “escape completely” and this is exactly what you will do as soon as you embark on the ship. As you cruise into Glacier Bay National Park, and the College Fjord you are getting as up close and personal as you can get; Princess is the only liner to take you this close to the beauty and grandeur that is Alaska. Watch out for amazing marine life, take in the stunning rugged coastline and remark at the majestic mountain ranges, all within your sight on this memorable adventure. A Princess Alaska cruise has all the amenities that you have come to expect from the Princess liners, including soothing spas, calming solariums, pools, casino, amazing nightlife and fine dining. They offer movies under the stars, kids clubs, sports, a well-stocked library, and you can even take a class to learn a new skill, all while enjoying the gorgeous surroundings. Take a Princess Alaska cruise a little bit further with the “on your own” tour that is a 10-day excursion where the last three days are spent on land, exploring the interior of Alaska. Stay in Princess hotels and ride on Princess trains while you visit the Denali National Park and the beauty of Fairbanks before your cruise officially ends. These as well as other Alaska cruise shore excursions make your trip more than just a cruise and will highlight some of the best things that Alaska has to offer, whether you opt for a hike, or take a helicopter tour of the region. For deals on cheap Alaska cruises, book early and check back often with your travel agent or online to ensure you get the best prices going. Most companies have special offers on non-peak times or for customers who want to downsize their cabin while still cruising the liner of their choice. 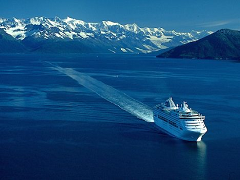 Celebrity Alaska cruise lines as well as many others cruise to Alaska on a regular basis, but for unprecedented access to the glaciers, wonderful on-board service and extras that will never leave you wanting more, a Princess Alaska cruise is the way to go.